Mortgage Choice is introducing new customer-oriented training and rewards programs internally as part of a brand overhaul that focuses on putting customer experiences first. The brand rethink was triggered by the mortgage broker’s expansion out of pure mortgage services and into financial planning advice. Having amassed more than 30 advisors and a national footprint, general manager of marketing, Melissa McCarney, said it was time to transform its brand strategy to suit the wider portfolio of services on offer. Mortgage Choice kicked off an extensive above-the- line campaign to showcase the new-look brand proposition and expanded product offering on 7 September. The ‘Happy As’ campaign was created in partnership with brand strategy agency, Moon Group, and focuses on how Mortgage Choice helps customers by offering financial products that they can better relate to, and which allow them to focus on what makes them happy, McCarney said. The advertising program started with television, radio and print advertising, however digital and social will also play a role. A social campaign incorporating both Facebook advertising and a content-led competition will launch later this week to help further drive interest in the ‘Happy As’ concept by encouraging consumers to share uplifting and happy moments, she said. 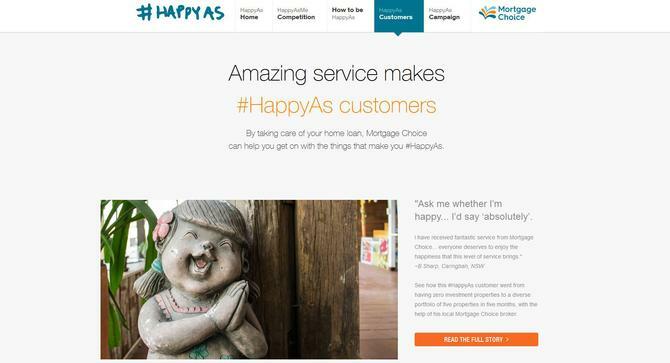 Mortgage Choice will also launch a microsite, happyas.com.au, to aggregate all content created via social channels. While a new brand name had been considered, market research showed the Mortgage Choice brand held considerable consumer equity and could stretch to accommodate its move into financial services, she said. Given the customer acquisition focus of the campaign activity, success will be measured on how many leads are generated, as well as improvements in brand awareness, McCarney said. The new-look logo and campaign manifestations of a brand overhaul that started from the inside out, McCarney said. Mortgage Choice has also launched a range of internal initiatives and programs to raise the standard of customer experience provided by the organisation. “What we also wanted to do was ensure we were delivering amazing customer experiences, so part of the work on the brand on the inside was looking at what an amazing customer experience really means, and what behaviours would we like people to exhibit when they’re dealing with customers,” she said. Mortgage Choice introduced a customer ‘service standards’ initiative and KPIs across its organisation and franchisee base in July, working with Moon Group division, Shift, on the strategy. “We have changed our recognition program for both staff and franchisees as well as KPIs; we’re also doing specific training for people internally to immerse them in what the service standards mean, and we’re incorporating these standards into our sales training for franchisees,” McCarney told CMO. McCarney said the program was driven by extensive internal interviews to get to the bottom of what the brand stood for. The good news was that the existing culture and values across the business were about living and breathing its customer promise, she said. To further improve customer retention, McCarney is now working closely with the general manager of operations and IT on a new CRM and email marketing platform, which can support both internal staff as well as franchisees. Data is another piece in this puzzle, and McCarney said Mortgage Choice is rolling out a new program using data to continue conversations with its customers by better understanding them. “This has been put into place so we can learn more about customers as they interact with us,” she said. “In my view, customer engagement is about having a clear understanding about what is happening with the customer with every single interaction with the brand… what is happening with the customer, how do they feel about what they’re experiencing and how you make improvements along the way and at the points that matter.